Eight- and nine-year-old students can use these year four vocabulary worksheets to review lessons about forest animals, the five senses, prefixes, and more. 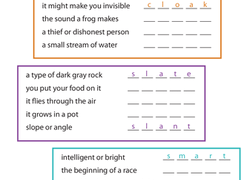 Third graders will have a blast as they learn vocabulary, with word searches, word scrambles, and word play! Use this resource with your students to practise using their own words to define key vocabulary terms.